If Kuta is the crowded epicenter of Bali’s tourism scene, the charming village of Canggu just 30 minutes away from downtown Kuta has become a haven for tourists wanting to escape the masses. Canggu refers to a long stretch of coastal villages located 10 kilometers away from the tourist-packed Kuta and Seminyak. It runs north from the village of Berawa, to the village of Cemagi, just before the famous temple of Tanah Lot. Although being in close proximity to the tourist concentration, Canggu manages to retain its distinctive charm of a Balinese traditional village while providing surfers with unrivaled surf breaks. If you come to Canggu from the direction of Kuta or Seminyak, take the shortcut of Jalan Batubelig rather than go through the main road of Jalan Raya Canggu. The shortcut is just a right-turn from the Lio square intersection that was made infamous after a video of a Bali police office receiving bribes in this spot went viral on the Internet. The shortcut will not only allow you to avoid the traffic on the main road, but also presents a scenic view that will slowly open your soul up to Canggu’s bountiful rural charm. As I carefully drive along the narrow and twisting road, a glimpse of lush terraced rice fields soon greets my eyes. In some parts, coconut trees line up along the main road and give the area the dense countryside appearance of the old Bali. However, just like in other parts of Bali, this has gradually been replaced by lines of private villas that are rapidly mushrooming in the area. Canggu is a laid-back neighborhood. People, be it locals or tourists, seem to have all the time in the world and move at a slow pace. The sun was scorching hot when I began my Canggu exploration. To hide from the piercing heat, I settled myself into a coffee shop named Butter, located just two minutes away from the members-only Canggu Club. Butter is a tiny coffee shop owned by a Polish expat who has transformed this space into a small haven that offers a wide array of coffee. Yet the decor is no doubt one of the first points of attraction for visitors. Styled like a European parlor, Butter is all white and baby blue and features cute, thoughtful ornaments hanging by the wall. The place is filled with white tables and 1930s-style armchairs, a fireplace and a teaspoon chandelier. It was the moment after I ordered my latte that I knew I had fallen in love with this cute cafe. Served in a small glass and not a cup, a cute smiling bear adorned my latte. It was hardly believable that this was made by the cool-looking barista whose hands were covered in tattoos. Although Butter does not offer Wi-Fi it is still a fine place to relax and chill where entertainment flows endlessly thanks to the people-gazing that provides an insightful peek into Balinese culture: penjor , long bamboo poles, decorate nearby homes; a group of ladies in kebayas pass by carrying offerings. It did not take long for the sun to rise higher, meaning it was time for lunch — and for that I didn’t have to look far. Along Jalan Berawa lie various eateries offering any kind of meal you could desire. From Mexican to Vietnamese, from healthy salads to spicy Balinese cuisine, the street has it all. The restaurants mostly occupy small or medium venues that remind me of the intimate feeling of going to your favorite warung around the corner just to have a quiet lunch with some friends. Thanks to a recommendation, we settled into Indotopia, a restaurant that specializes in Vietnamese food. Located a stone’s throw away from Butter, they serve fresh Vietnamese pho along with Indonesian-style spicy tuna. Another good option is Cafe Canggu, which is located behind Jalan Berawa. After a short trip, you will find yourself dining in a nicely decorated old-style joglo , or gazebo, with a breathtaking view of green rice fields. 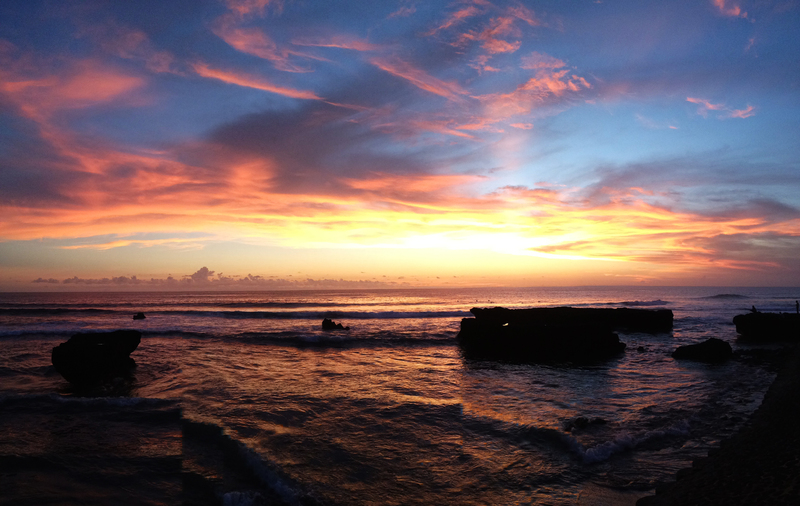 Canggu’s long coastline offers beaches that are perfect at sunset. Most are not suitable for swimming because of dangerous rip currents, but they are renowned among surfers for their challenging reef breaks. Berawa or Nelayan (fisherman) Beach is the first on the list. As the name implies, this beach is used as a base for fishermen’s activities in the area. Colorful fishing fleets pulled up on the shore, providing a contrast to the dark sands that dominate Canggu. The beach is quiet and empty and there is lots of space to just sit around and chill, although there is no warung or cafe available in the area. The next beach to the west is Batu Bolong, popular among surfers for its powerful waves. In the parking lot, there are plenty of board-hire shops and surf lessons for beginners, but for those who prefer to stay on dry land, the hunky surfers are quite a pleasant sight on their own. The beach is also frequented by locals who come to chill in the evening. There are many warungs, and closer to the beach, street food vendors offer cheaper options of baked corn, bakso and satay. However, with so much activity at this place, sadly the beach is not kept clean. Plenty of plastic bags and other trash are scattered all over the beach. Perhaps a more upscale option to close the day is a visit to the nearby Echo Beach. The beach, also known as Batu Mejan, is equally popular for surfing. Echo Beach is characterized by its line of fancy cafes, many of which specialize in seafood barbecues. To watch the sunset, I settled myself into Dian Cafe and sipped on their refreshing blended coconut juice. Slowly, the sun set against the background of an orange sky and big waves breaking against the shore. Surfers danced in silhouettes ripping up and down the last waves before dark. The view was simply mesmerizing. The beaches in Canggu are less crowded, and rice fields still survive. But hurry! This gem is being overrun by crass villas built by absentee landlords.